These days, so many books are being made into movies and TV shows. A few popular examples would be The Twilight Saga, Harry Potter Series, The Hunger Games Trilogy, and The Help, all being turned into movies. Books like The Vampire Diaries, Pretty Little Liars, and The Nine Lives of Chloe King have all been turned into TV shows. 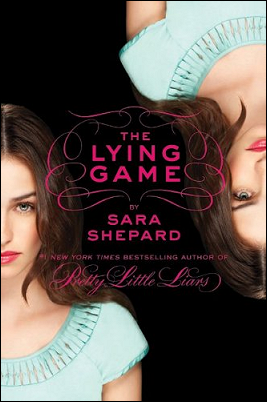 Now, the newest one, The Lying Game, by Sara Shepard, has been turned into a TV show on ABC Family that airs Mondays at 9:00 PM (US ET). It's a fairly new series that just came out in December of 2010. People have barely had any time to read this wonderful book before it came on television. "I had a life anyone would kill for. Sutton Mercer had the picture perfect life. Popularity, a hot boyfriend, and the best of friends were all hers. But what she didn't know was that someone was watching over her, waiting to make their move and take her life away. Sutton also had no idea she has a twin sister named Emma Paxton, who has the opposite of a picture perfect life. Abandoned by her birth mother at a young age, Emma has lived in countless foster homes, trying her best to keep her head held high. When Emma discovers Sutton on Facebook and arranges to meet her, she is ecstatic. I mean, who wouldn't be? Finding out you have a twin sister doesn't happen every day. When Emma arrives in Arizona, she finds out that Sutton never spoke to her in the first place. She has already been killed. Emma is forced by Sutton's killer to take over Sutton's life and pretend to be her, living in her house, addressing her parents by Mom and Dad, laughing with her best friends, and kissing her boyfriend. Emma is determined to find out what exactly happened to her long lost twin. But can she keep up the act forever? Narrated by the now murdered Sutton Mercer, you'll never be able to put this book down. "Let the Lying Game begin." The series has two books so far, The Lying Game and Never Have I Ever. The next book in the series, titled Two Truths and a Lie, comes out in January, 2012. I am obsessed with both of the books. They are thrilling, shocking, addicting, exciting, confusing, and all around amazing! 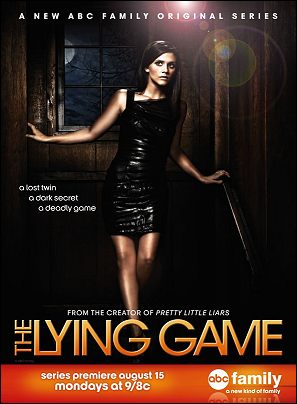 If you love mystery, then The Lying Game is the series for you. As mentioned above, this is a fairly new series and not many people have heard about it yet. Books are always far better that the movies or TV shows they are adapted into. With this series, that is entirely true. By only watching the show, you don't get to know the characters as well. You never get to experience Sutton's voice and all of her flashbacks. Neither of their back stories are mentioned. You don't get to read all of those heart-stopping and breathtaking events. My mouth dropped at some of the scenes as I read them. The show could never have the same effect. This series is great the way it is, but ABC Family changed so much of it. They changed a few of the characters' names and their roles. Most importantly, they made Emma and Sutton (both played by Alexandra Chando) meet each other! In the books, Sutton is dead before Emma arrives, which makes the mystery more suspenseful and confusing. In the first episode of the show, Sutton tells Emma to take her place for a few days while she goes to follow a lead she has about their birth mother. In the books, Emma is never asked by Sutton to do anything, because she is already murdered. She is blackmailed by the killer to do it. Emma also spent a few years of her life with their birth mother in the books, but in the show neither of them knows her. I'm not saying the show is bad, because it is actually a great show. However, I guarantee that you will get a much more captivating experience by reading the books. So, don't just watch the show - read the books too. You won't regret it. You won't be able to tear yourself away from these amazing novels.